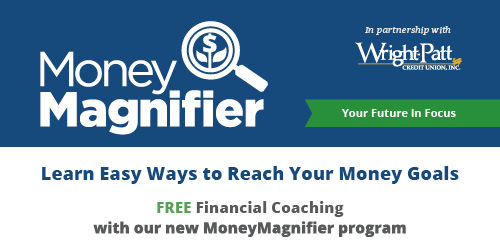 Learn Easy Ways to Reach your Money Goals. Free financial coaching for Homeport residents. In partnership with Wright-Patt Credit Union, Inc.
Health care costs are the number one reason Americans suffer financial stress. Student loan debt – now at $1.5 trillion – is painful. And over 11 percent of dual income households send their children to childcare, a contributing factor in missed credit card payments and deeper debt. Well, lucky for you, it is tax return season. In 2019, 70 percent of all taxpayers will get a refund from the U.S. government. The average American taxpayer will receive about $3,000 back from income tax filings. Consider your returns a duffel bag of cash on your front steps – or in your mail box. Do you have a plan for new found wealth, to close the gap between income and expenses, and build a nest egg for future goals (like buying a home)? ● Buy some peace of mind by investing some of your refund in a savings account. Knowing you have some money on hand to cover unexpected expenses – car repairs, hospital bill, or job loss – can help you sleep better at night. ● If you have credit card debt, paying it off can be one of the best investments you can make with your refund dollars. ● Save money for retirement in a 401K or IRA financial vehicle. ● Leave some money for yourself to splurge. Take your “mad money” and invest in yourself. Take a vacation. At Homeport, we are here to help you create such a plan, to overcome roadblocks and achieve your financial goals. We will review your credit and help you develop a budget to pay down debt, save money and reach your goal of homeownership. Don’t put it off any longer. Act today by calling us at 614 221-8889 or sign up for classes at www.homeportlearning.org. Make 2019 the year you turn your financial goals into achievements, with a little help from Uncle Sam. BalletMet’s Discover Dance Scholarship Program offers children in the Central Ohio area opportunities for quality ballet and dance education and training. This scholarship provides a child with fully funded year tuition to the BalletMet Dance Academy. Scholarships require an audition and must be renewed annually basedupon review of criteria. WHO CAN PARTICIPATE IN THE AUDITION? WHEN ARE THE PRELIMINARY COMMUNITY AUDITIONS? Your child only needs to attend one of the Preliminary Community Audition dates. Plan on being prompt to the registration times. Children arriving after registration has closed will NOT be allowed to participate. WHAT SHOULD MY CHILD BRING TO THE AUDITION? A completed Discover Dance Student Audition Form. Dressed in comfortable clothes that allow for movement. A great attitude and passion for dance! Dance professionals from BalletMet will screen children for potential and identify kinesthetically gifted children for training in classical ballet and other dance forms. Children selected must have feet and ankles capable of handling pointe and ballet work, thus these areas will be assessed. Please communicate with your child that they should demonstrate their best behavior and love of dance. All participants will be notified by mail of preliminary audition results. Final Auditions will be held at the BalletMet Dance Academy on Saturday, May 4, 2019 for students who pass the preliminary screenings. WHY SHOULD A CHILD PARTICIPATE IN THE AUDITION? BalletMet is committed to bringing the positive influence of ballet and dance to the Columbus community. Through the Discover Dance Scholarship Program, BalletMet strives to make the art and discipline of dance available to talented and committed youth. Questions? Contact Leigh Lijoi at BalletMet. Call 614.586.8629 or email education@balletmet.org. United Way’s Tax Time Program will host Super Saturday – the largest free tax preparation event in central Ohio – on February 3 (9:00 a.m. to 5:00 p.m.) at the Columbus Downtown High School. More than 100 volunteers will complete hundreds of tax returns in a single day. Homeport wants to hear from you! Homeport wants to make a positive difference in our community and for our residents. We have asked Measurement Resources Company to help us develop ways to measure how we impact our community. We really want to hear from our best resource, YOU! On Monday, March 18th, you will receive an email from Measurement Resources Co. that contains an invitation to complete an ONLINE survey. If you do not see the email by late next week, please check your spam and junk folders for “Homeport Quick State Impact Measurement Survey”. The survey may take up to 20 minutes to complete. The deadline to provide your input is Friday, March 29, 2019. Survey results are directed to Measurement Resources Company and will remain confidential. If you have any questions about this survey, you may contact Ethan Hug at Measurement Resources Company at 614-947-8899, or send an email to EHug@measurementresourcesco.com. Thank you in advance for your participation in this survey. We truly appreciate your time and input into helping us be a better organization! The Jerry Grier Scholarship Program, funded through the Ohio Capital Impact Corporation (OCIC) and administered by I Know I Can (IKIC), provides the opportunity to apply for the award of both a tuition and performance based scholarship. The 2019 Jerry Grier Tuition Scholarship is distributed to the academic institution to cover the costs of tuition and fees. Amount based upon your school’s cost of tuition and fees, your financial aid, other awards/scholarships/grants, and is designed to reduce your out-of-pocket-costs for tuition and fees. The 2019 Jerry Grier Performance-Based Scholarship provides a reward to students for maintaining good academic progress. Good academic progress is defined as earning grades of “C” or better in all classes that are taken during a semester. This scholarship provides financial support for cost-of-living expenses and is paid directly to the student. -Must be a resident in good standing named on a lease of Community Properties of Ohio (CPO) or other properties of which Ohio Capital Corporation for Housing (OCCH) is an investor. Please see your property manager for confirmation. -Must be enrolled in a college, university, or trade/professional school and registered part-time or full-time. -Additional eligibility requirements can be found in the 2018 Jerry Grier Scholarship Application. Improve your money management skills with a financial fitness workshop. From Mid-Ohio Foodbank food deliveries for seniors, to mammogram truck visits from OhioHealth, non-profit partners throughout Central Ohio provide services to residents of Homeport. Watch the following video on one our newest partners: At Home by High.